Here's a breakdown of my backyard composite of the Mind-flayer from Stranger Things. I modeled the thing in zBush based off of some still references from Stranger Things. Then exported the model and composited it into a photo I took in my back yard. I did the composite in After Effects with Element 3D. The idea actually all started with the photo, I was looking out my window and smoke was billowing across the yard from a neighbor's dryer vent and the sky was ominous and I just imagined seeing this thing emerge from the clouds. Here's the final composite before I graded it. 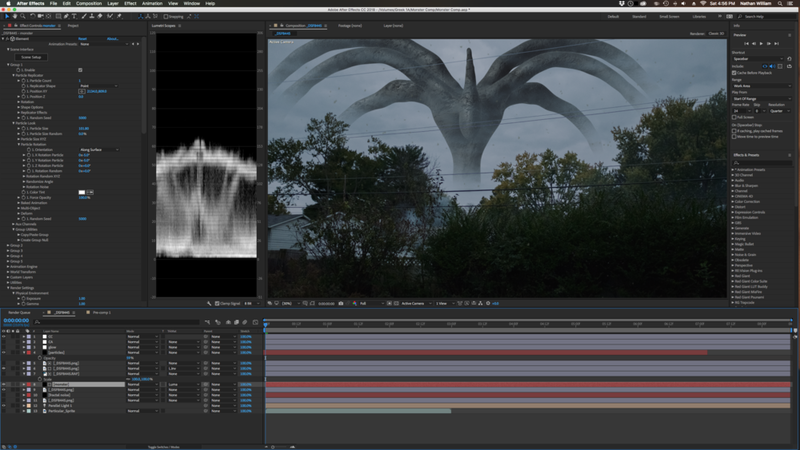 I also used Trapcode Particular to add some subtle flying leafy debris to the air around the monster. And here is the final composite. To make it fit in with the exact style of most of my Instagram photos I graded the final composite on my phone in VSCO with the same presets I usually use. I went through several iterations to get the subtly just right. I also added some soft lighting to give him some definition and blurred and faded him so he looks like he's at a distance. The key is many many levels of small details that all make up the whole. Like anyone we've been binging on Stranger Things Season 2. In light of the recent release we decided to do our own short based on an idea that stemmed from a recent sleepless night in the life of our buddy Jonny Ringle. Happy Halloween, enjoy!